Léon: How would I become a space man when I grow up? Me: Well there's always the European Space programme. Léon: Is there? What channel is it on? On Sunday my mother-in-law sent us out for our second childfree meal in a restaurant since we had Anna over six years ago. Thomas opted for the local Scottish restaurant Ian Brown's, as he'd recently seen it recommended on Twitter by Patrick Harvie. What a treat it was to get such exquisitely-prepared and yet reasonably-priced food so close and yet so far from our daily grind. It was a real sanity break. Science Centre trip, a photo by PhylB on Flickr. At the weekend Brita invited us to the Science Centre. 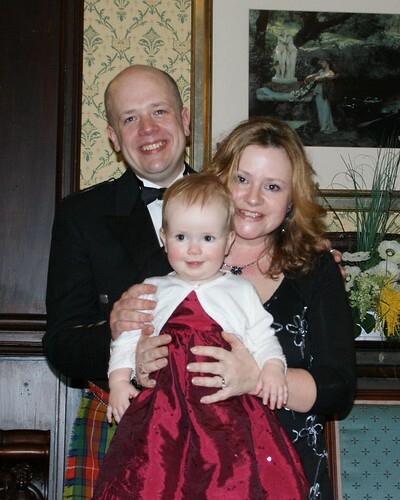 With such a large family this has long been beyond our means (we last took all the kids in 2006!) 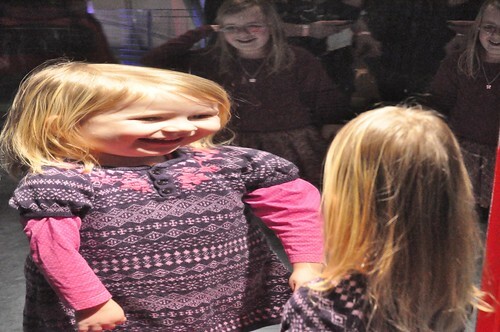 Catching Amaia unawares as she looked into the warped mirrors was such a treat for me as a mum and as a photographer. She was so bemused, happy and proud all at the same time, and Anna looked on delighted too. Mummy and daddy are married now!, a photo by PhylB on Flickr. 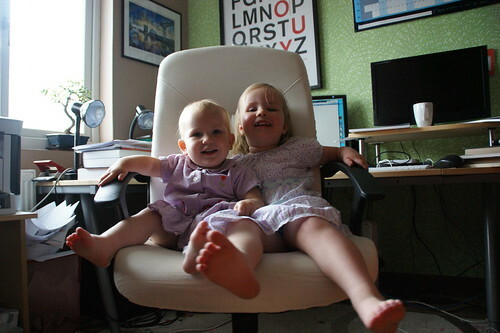 Playing on daddy's office chair, a photo by PhylB on Flickr. I remember in my early days in publishing I used to stress about being on a two year contract, now a two month one makes me float with joy because it means I can plan my life, even if just a little bit. A two year contract now would be an unimaginable delight! On top of that, you can attend any meeting your kid's school throws at you, and any hospital appointment or similar. Those are a few of the pluses, if you can call them that. When a relative is in hospital, you can hold their hand at visiting hour and catch up with work on your own time - there's no price you can put on that. I am unimaginably grateful that I was self-employed during my dad's cancer. Visibility is another absolute nightmare. When you are an employee, being given as much notice as possible of something helps. As a real example, we were told roughly four months before a family christening that is was going to take place. Had I still been an employee, I'd have booked the necessary four days off to go back to Denmark and not thought another thing about it, but as a self-employed person, the best I could do was say to clients that I'd rather have as little work on that week as possible. Of course, sod's law meant the week of the christening came and a customer's emergency left me with two weeks of work to fit in over the four days I had been trying to schedule no work for, followed ironically by two weeks of nothing when I could have attended the christening except I was too late. I could have refused, of course, but then that customer would have been inconvenienced and would have had to find and use a different freelancer with the same skill set - not the wisest move, so work had to come first. The other issue, of course, is that by not having the visibility to book months in advance travel always costs a premium. Travel for seven booked within a week of departure would make your eyes water! Booking non-refundable tickets for seven in advance on Ryanair and then being unable to use them is equally upsetting. Often I'm asked what my plans are for the school's summer or autumn break - I don't even know what my plans are for the Easter one (in three weeks)! I may (or may not) be told that next week! So I'm in that difficult situation of being unable to book childcare in case I am working but being unable to refuse work should it materialize! And as for working out if I can pay a five year car loan or similar - that's a dream long rooted in my past. On the last week before my five kids started their summer holiday last year, I was asked to work every day of the summer holiday for two different clients. So I did one during the week, and the other on weekends! It may only have amounted to a few hours each day but while looking after five kids??? Would you volunteer for that job? And when you don't have any work on, you don't enjoy the break because you wonder if you'll get any work again soon. Salaries have to be paid out of something, so you stress away every break trying to find work. It is great for the client because you always know you have to do better than your best to secure future jobs, so you give it your all, you spend extra time unpaid and you do a much better job than you would have done, had you not been freelance. Then there's payment. I often see Facebook statuses mentioning 'X' days to payday! I fondly remember those! Now I wonder if clients are going to pay me on time so my salary can go through, or maybe just one month after I have completed a job, or sometimes if the client is international, I try not to invoice until I have done several jobs, simply because international transfer fees eat up so much of my fee. I can wait months to be paid. Bereavement leave isn't something I ever had to use as an employee, but at least it existed. When my dad died in 2012, it felt wrong to discuss his funeral in the morning and work in the afternoon, but you don't get time off when you work for yourself. If I don't work, I don't get paid and losing my house would not have brought my dad back. It felt surreal to need to do translation work in those circumstances and my clients were lovely - they offered not to send me work for a couple of weeks till I felt like working again, but of course, no work, no pay, no mortgage payment, no house... Freelancing has its inhumane sides. I think the thing I really never grasped before opting for this life was the lack of escape. When you work from home, you are always at work. You aren't just checking your email from home or finishing a wee thing - I did that as an employee. You are in your day-time office, eating, sleeping, living... You don't think 'It's Saturday, I'll go to the park', you think 'It's Saturday but if I get ahead with the stuff I need to send in next week then I'll be able to meet the deadline even if a kid is sick and my client deserves that I do my best' and so you work while stirring the dinner, you work in bed at night, you work when the baby's at nursery or when she falls asleep, you work in ten minute bursts 24/7 and when you aren't working you are working in your head and that way you meet all your week time deadlines and remain the model worker, at the expense only of your sanity, but who needs that anyway? Do I prefer one or the other? I don't even know any more to be honest. I hate not knowing when I can book a holiday. I hate never having a day off, I hate the lack of visibility. I love being home when my kids come in from school, I love hugging them better when they are sick, I love working all day with my best friend, my lover, my husband... I don't know. Maybe working from home, on a contract as an employee would suit me best but for now, while my kids need me, working from home is the only way, for better or worse. It is nice to see some sense in the media for once. I have to say, as someone who lives in a multinational and multicultural home, I find the idea of us being the only people on the face of this earth not capable of making decisions about our own future more than a little condescending. 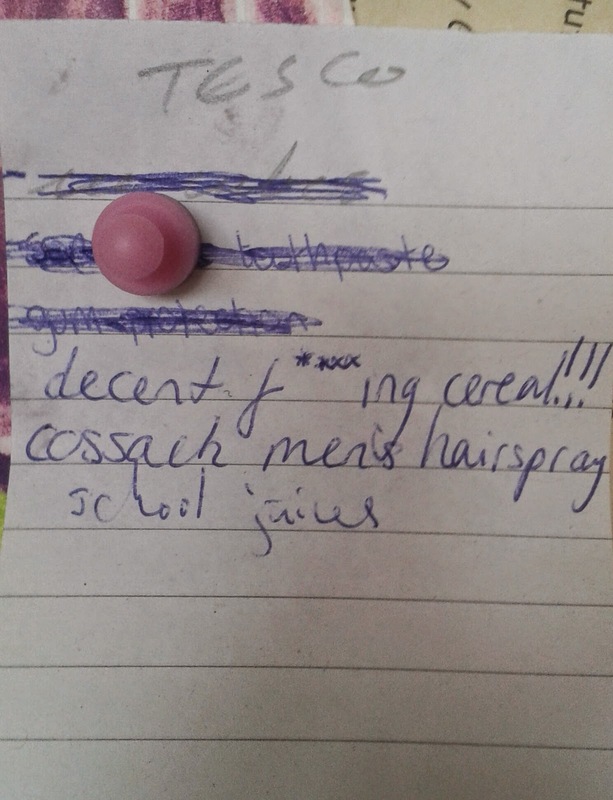 Last week we had a Georgian professor staying with us. Ages with me, he had grown up in Soviet Georgia and seen his country of 5 million people fight for their right to independence. He was incredulous that any nation would prefer to abdicate that responsibility. No matter how we tried to explain the Scottish fearties to him, he just could not comprehend that mentality. Interestingly, the international media seems to agree. It's a shame so many of us are watching the BBC instead of reading it. 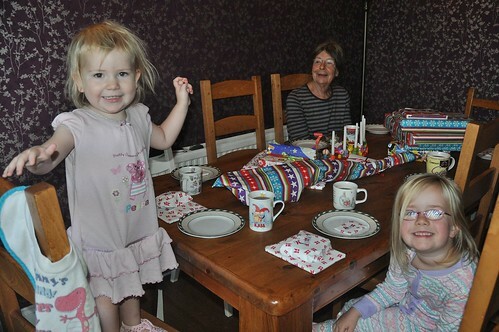 Mum's 70th birthday party, a photo by PhylB on Flickr. 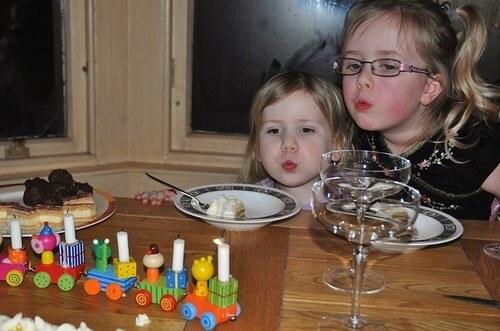 I like the way I've managed to catch the girls blowing out the candle on granny's birthday train on Saturday. They seem very focused on the task in hand. Léon's birthday breakfast, a photo by PhylB on Flickr. Thomas's mum can recount amazingly detailed memories from when she was an infant. She remembers being fed before she could speak and feeling distressed at being unable to explain when she was full. 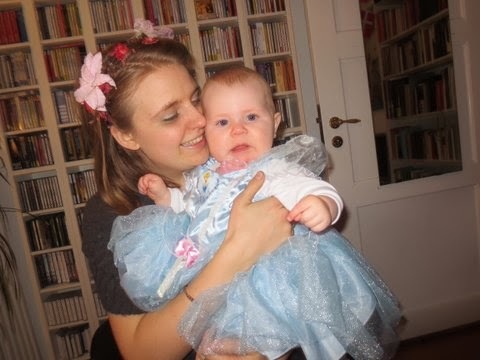 I'm not sure if Anna or Amaia can remember their babyhood but they both definitely seem to have inherited traits from their grandmother. Anna described to me in detail recently how she broke her leg at the age of two, which leg it was and what colour of tights I put over the cast to protect it. 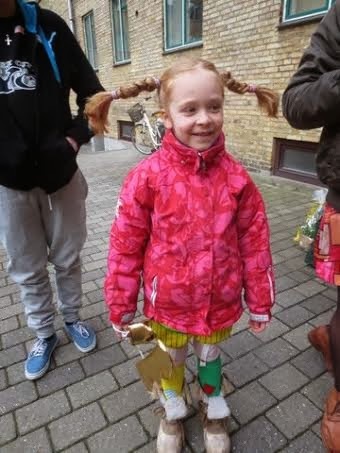 She also told me about a trip to Copenhagen zoo with her cousin Ursula which also took place when she was two. As I was not with her there are no photos of the event to jog her memory either. As for Italy, which she hasn't seen since she was four, she can describe it in great detail. Yesterday she was telling me all about the neighbour, Margaret's plunge pool, its depth and the float she used and how she had been scared of the wasps the water seemed to attract. 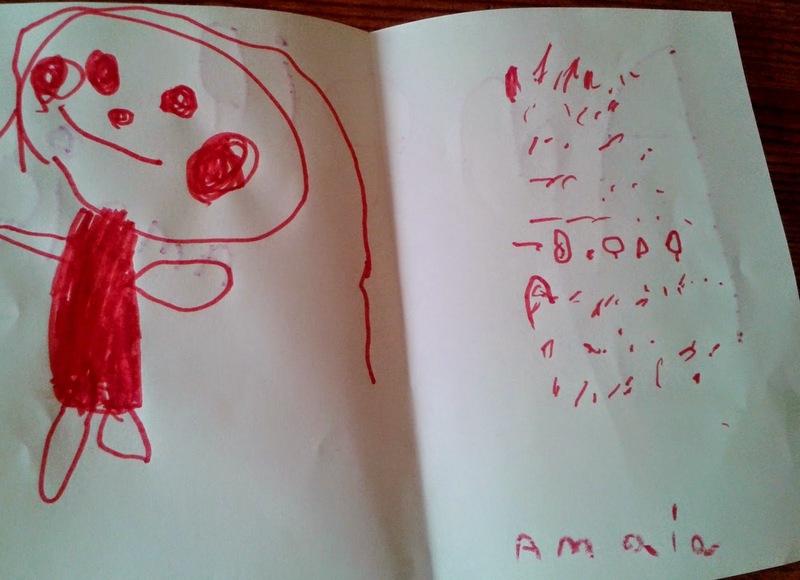 Amaia too has very strong visual memories of being two. 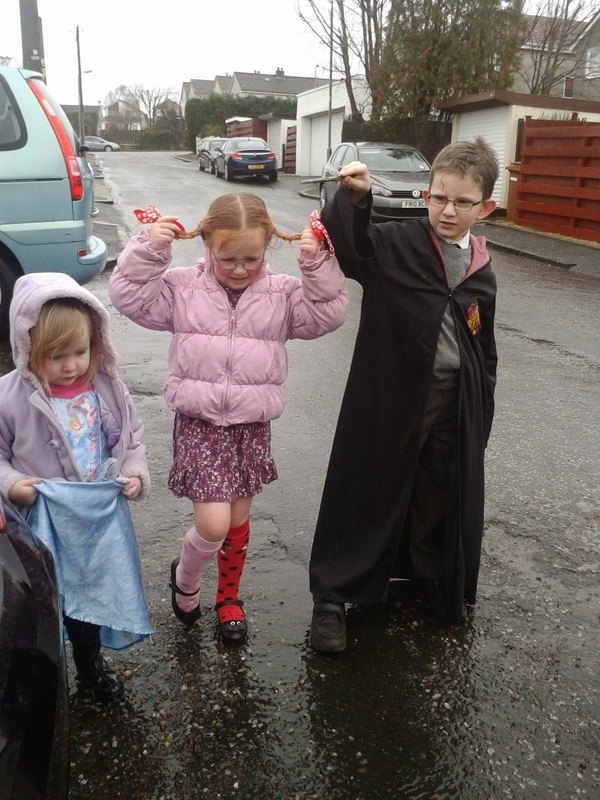 She often points at lucozade bottles even today and says 'Pumpa's drink', despite the fact that he died when she was two. She uses the word 'yesterday' to mean at any time in the past so I'm often thrown when she starts telling me about 'yesterday' until she fills in the details that pinpoint the event as being one or two years ago. She's particularly good at remembering what she wore on specific occasions, or what she ate. It's funny which genes kids seem to inherit. 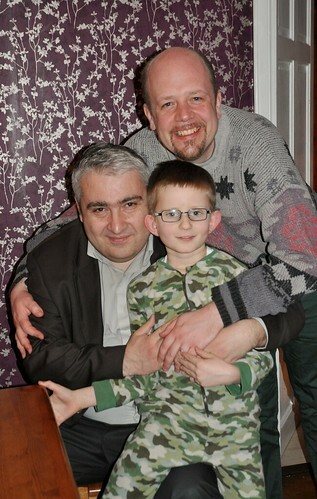 Kakha's visit, a photo by PhylB on Flickr. I was out with my camera last week showing Kakha round Glasgow. One of the things I love on those very Scottish days when you get every season within an hour, is when you see that stunning effect of sun on sandstone against a backdrop of slate sky. 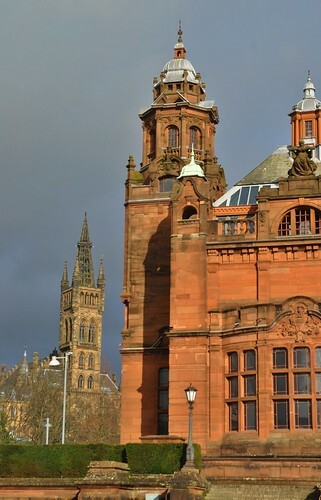 It's definitely my favourite lighting for Glasgow photography. Léon has been fascinated by all things foreign since before I can remember. His ear for phonetics in Danish and French have always been surprising even before he couldn't read or write. He would point out nuances of sounds that even I found barely perceptible. He has also always been drawn to languages he doesn't understand. He loved the sound of Italian the first time we visited Thomas's parents in Italy and was desperate to learn what the villagers were saying. This last week has taken that to a new level. Thomas's friend Kakha was here visiting from Georgia. Eighty percent of the conversation for the week took place in Norwegian, with about ten in English and ten in Georgian for good measure. One evening I came in to find Léon sitting contentedly at the dining table taking everything in. He was then able to explain to me in great detail the ways in which Norwegian distorted the Danish words he was used to and how he could then guess from context what the words that differed in Norwegian must mean. Given his knowledge of Danish is much more spoken than written, drawing the parallels between the two languages is harder than it would be if you were a fluent reader of Danish so I have to say I was impressed. But not only impressed with his understanding, also by the look of contentment such an exercise gave him. He just loved having someone so exotic to brighten up his mundane Scottish winter. It's been such a long time since anyone has stayed that he was becoming quite fed up and this has definitely perked him up. He's too sociable a wee guy to make do with just his six cohabitants! His reaction to a week of Norwegian reminded me of the time, as a child, I found a bottle of shampoo in a campsite shower. Its label was written in Dutch. I sneaked back to my tent with it hidden in my jacket as if it was a precious treasure. I was drawn to the exotic too as a small child. I remember reading and rereading it trying to make out what meant what. I couldn't have been more than nine or ten. I definitely think Léon is a chip off the old block, though he is growing up in an international enough house to hopefully satisfy some of his curiosity. When Kakha left, Léon was very sad. If he could have his way, he'd have a different foreign-speaking guest stay with us every other week. I must try to find out if there are any lucrative niches for linguists before he gets to uni age - because I'm not sure he'll want to become Complexli's third member of staff one day!